Let the 12 Days of Christmas Commence! I’m so excited for this time of year. Not only do we get to see twinkle lights and mass amounts of red and green in our house for a few weeks…but it’s party time here at KBS! There is much fun to be had over the next twelve days. 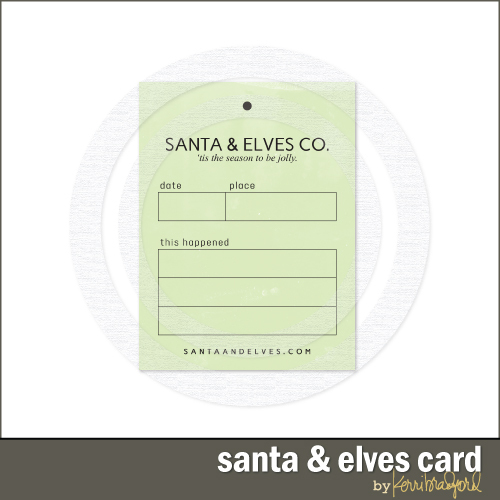 Fun ideas, giveaways, guests and the ever popular one-day only freebie! You never know what each day will bring, so you don’t want to miss a day! I think we should start off with a couple of beyond amazing holiday cards by our sweet friend, Miss Nichol! Aren’t they just the cutest cards you ever did see? How darling is that wreath and bow on the van??? 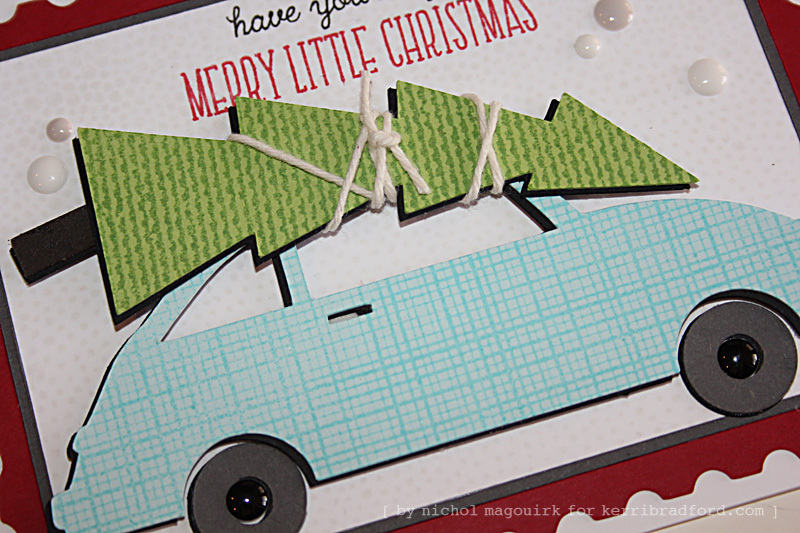 When I saw the car with the tree strapped to the hood from Kerri’s new Santa’s Workshop Class, I thought it would make the perfect Christmas-themed card. It got me to thinking if Kerri had any other vehicle images and of course, she does! The Going Places Kit has an awesome van that I thought would be super cute with her Hollyberry Wreath and and a bow from her Big Red Bow Kit. I wanted a way to “frame up” these fun holiday vehicle scenes so I grabbed the postcard edged frame from her Life Additions #2 Kit and created an inlay-style frame to really showcase the die cut vehicles. I did an offset of the inside cutline of the frame, giving me 3 cuts and 3 pieces to create the inlay (the red outer border, dark grey tiny border and the inside white piece). To really “dress up” the die cuts I grabbed some of my favorite Impression Obsession Cover-A-Card background stamps and added some tone-on-tone texture to the die cut pieces. I love these large sized background stamps because they work on really large background (or in this case die cuts!). I gave the vehicles a little more dimension by cutting the pieces again from black cardstock and layering the individual elements on each, slightly offset and then assembling the scenes. 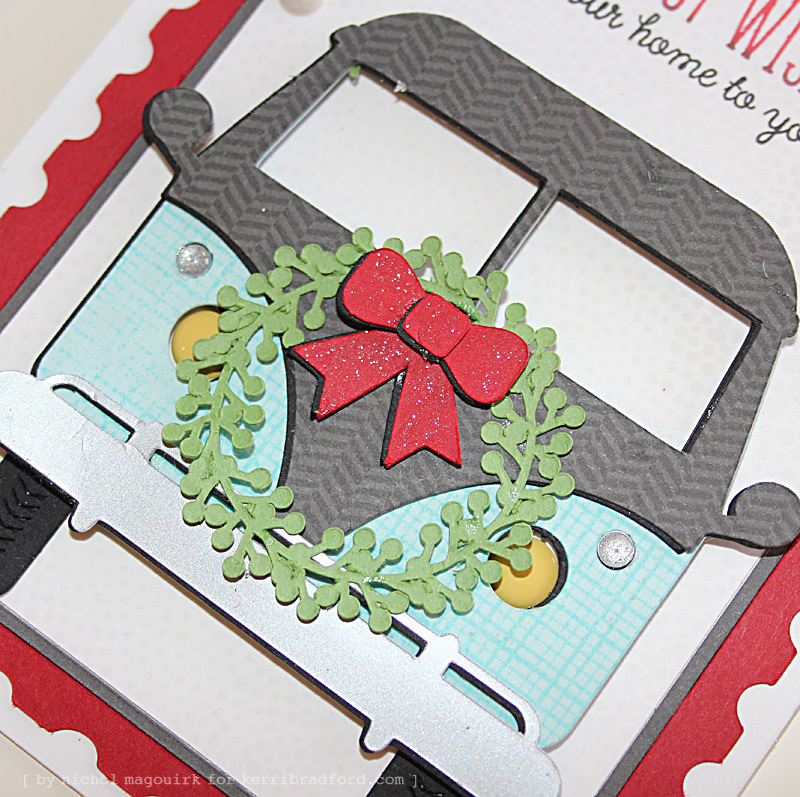 I popped up the vehicles with a bit of foam adhesive, adding some finishing touches with enamel dots, string and a glitter pen and finished each card with a stamped greeting! That has totally put me in a festive mood. And now, for the one-day only freebie! Thanks for the 12 Days of Christmas freebies! They are always fabulous and it is so fun to see what you have each day. It is my version of an advent calendar. Thankful for the download, many wishes on this holiday season and the reason. Dec1 …what a fun way to start the run up to Christmas! Love these adorable cards, such fun! thanks for the fabulous freebie too! Adorable cards! Thanks for the free printable! Absolutely wonderful Christmas cards. Love your designs. Thank you for the cute freebie too! Thanks for a great way to start December! I love the freebie! So cute!! Thanks! This will be so cute in December Daily! I. LOVE. Those cards! I would have to frame it if I received one in the mail. And thanks for the santa and elves card, so cute! Thank you for the freebie. Looking forward to MORE!!! Thanks Kerri, you are the best!!! Oh my goodness, these cards are so jingle worthy! LOVE them! 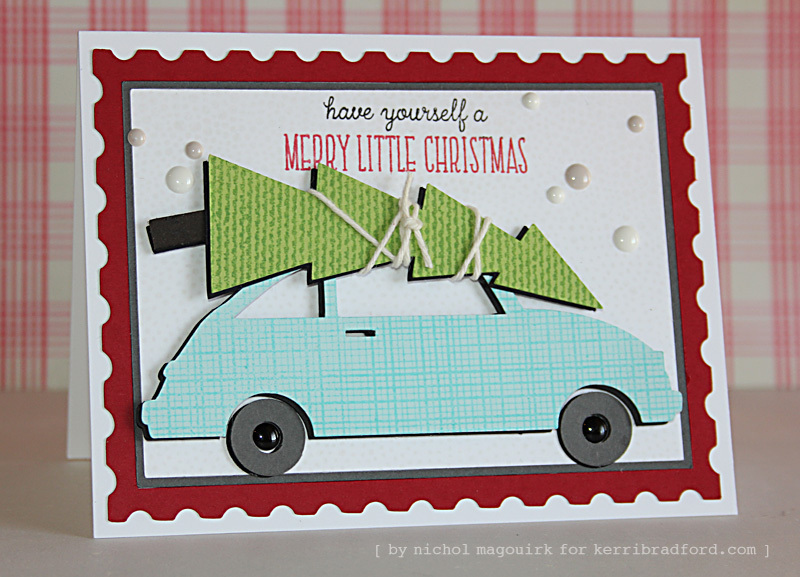 And you know, since I took the Santa’s Workshop class and I built my own little Volkswagon, I am going to use Nichol’s tips and tricks to make my own set of cards- thanks, Nichol and Kerri. I will enjoy the next 11 days “with you”! PS Thank you for the freebie! 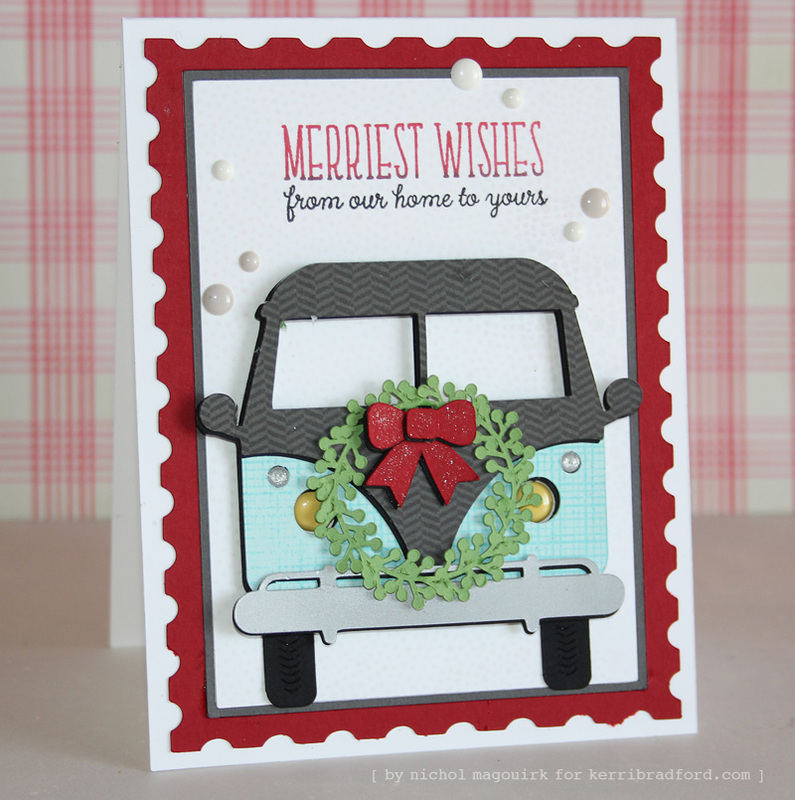 I just love your 12 Days of Christmas and I am TOTALLY loving Nichol’s VW Bus card!!! Thanks for the fab freebie! Can’t wait to see what this month brings! I really want to take the Christmas Workshop but it says that you need the prerequisite so I’m hoping JS will get the new classes uploaded soon! How long will you keep the Christmas Class available? Love Nichol’s cards! Pulled out my “Jingle All The Way” frame today with the Christmas decorations. Does not seem like it has already been a year (I’m in December denial too)! Thank you for your designs and the awesome freebies too. very cute cards! thanks for the first in the 12 days of Christmas! Thanks, Kerri! This is very cute! and I love the cards! Thank you for the freebie! I’m looking forward to all 12 Days to see what you are sharing. These cards are fabulous! 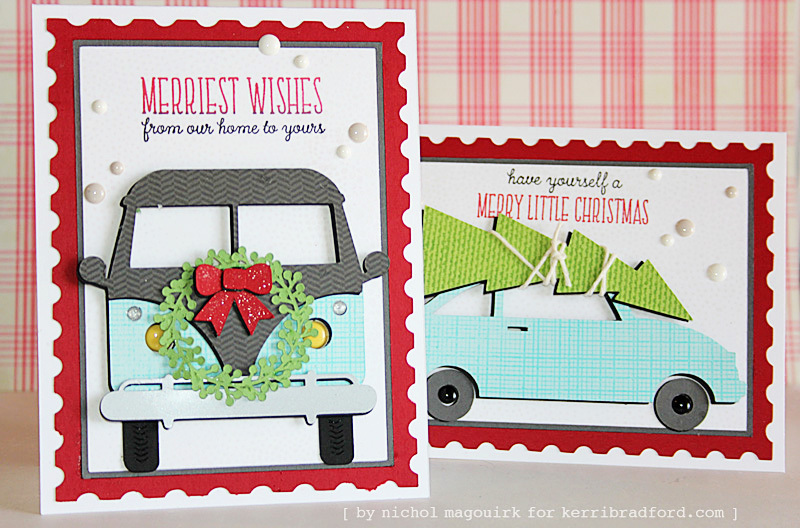 I love Nichol’s details – the twine to “tie down” the tree on top of the car…the glittery ribbon for the van’s wreath – just perfect!! Love this cute tag! Thank you! Thank you so much for the freebie and for being so great. I love seeing all the fun things you come up with! Thanks so much for the freebie! Enjoy the season!